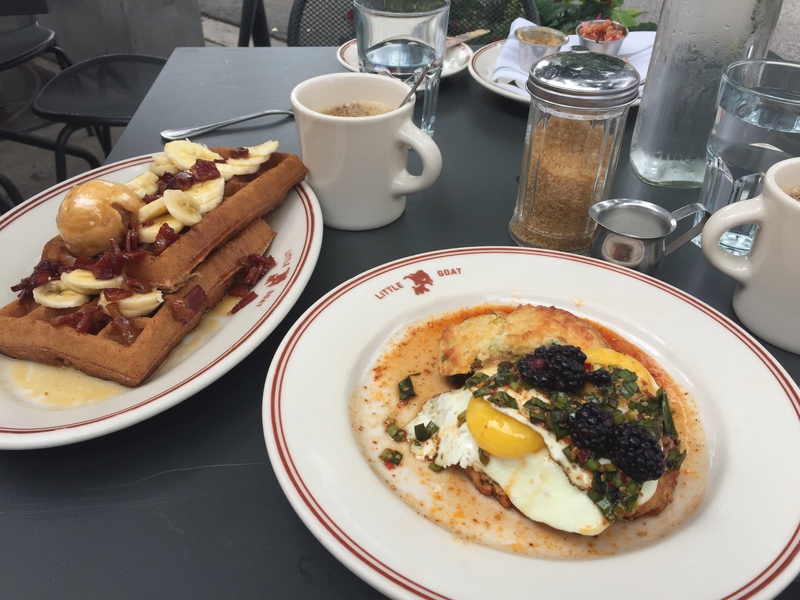 If you’ve ever been to Chicago you know that brunch is a weekend way of life. This week’s Foodie Friday is one of my favorite brunch spots. Little Goat Diner is best described as comfort food with a gourmet twist. Both Little Goat and her big sister Girl & the Goat are the vision of executive chef Stephanie Izard, the Season 4 winner of Bravo’s Top Chef. Don’t let the “diner” moniker fool you, this West Loop hotspot is far from the small town greasy spoon we all have a love/hate relationship with. The menu is lengthy and creative, overflowing with options from their diner, coffee shop, bakery and bar. Overwhelmed by the delicious spread, my friend and I decided to order dishes to share, starting with the bread of the day: bacon and gouda. The bread of the day rotates regularly, as do the relish and butter sides. That particular day the relish was corn and pickled cherry, which had a salty-sweet quality that I didn’t love. However, the pimento cheese butter was perfection. 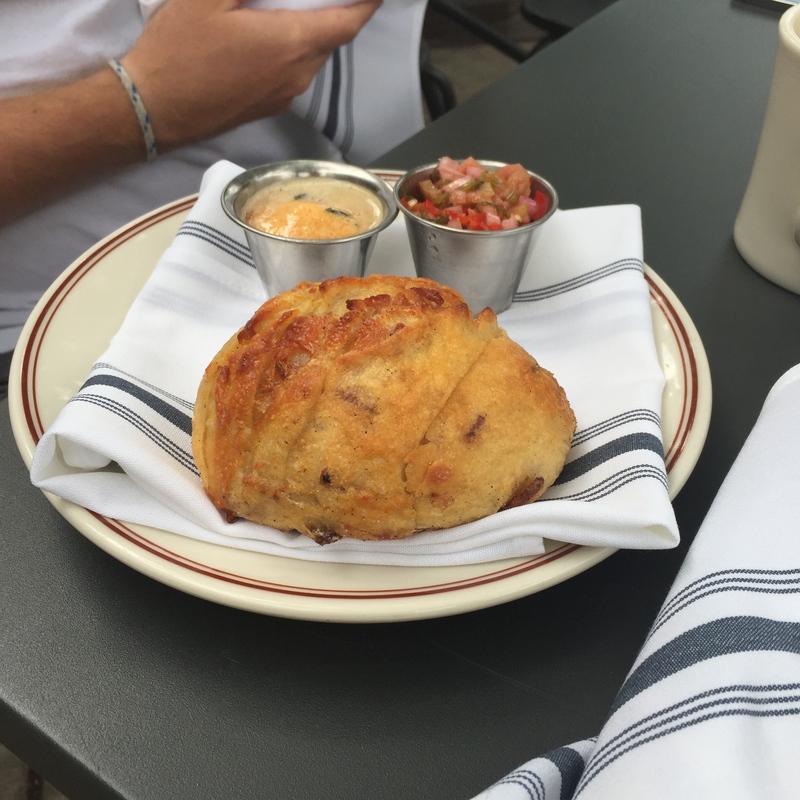 Bacon and cheese stuffed in freshly baked bread dipped in cheese butter – did I die and go to heaven? Our first main was This Little Piggy Went to China – a sesame cheddar biscuit topped with a sunny side egg, Szechuan pork sausage, chili garlic chive sauce and…wait for it…blackberries. We were clearly feeling adventurous. With a spicy, tangy, yet sweet combo, my taste buds felt a bit confused. Not unhappy, just overwhelmed. Once deconstructed, the zesty pork and salty cheese biscuit were my favorite elements of the dish. Something savory must always be followed by something sweet, am I right? Enter the Fat Elvis Waffles. I’d been eyeing the menu for weeks and was dying to try these. Sourdough waffles, smeared with peanut butter infused butter, capped with bananas and drizzled with bacon maple syrup. I’ll just let those words sink in for a moment… Is your mouth watering yet? Little Goat Round Two was a few weeks later. While I love a leisurely brunch, I’m also a fan of the mid-week breakfast meeting. It gets you up and out early, fully maximizes your time for the day, and allows you to enjoy a delicious meal minus the weekend crowd. This time I went a bit more traditional and ordered the blueberry pancakes. Little Goat makes their pancakes with sourdough batter – a rich half buttermilk butter, half sourdough starter concoction. Needless to say, I wasn’t counting my calories that day. The sourdough starter cuts the sweetness that you find in the typical diner pancake, but I think at this point we’ve established that Little Goat is anything but traditional. Stuffed with the perfect amount of fresh blueberries, topped with an oatmeal crumble and dripping with maple syrupy goodness, it’s luscious without being sickly sweet. My favorite part was the crumble, which reintroduced just a hint of sweetness, as well as a pleasant crunch. Is your stomach growling? Are you craving those devious carbs you’ve been avoiding all week? You’re welcome. I’m guessing you’re also now tempted to make brunch plans, even if you’re not as familiar with the weekend ritual as we Chicagoans are. Well cheers! Enjoy. And Happy Friday.